The royal couple meets the youth delegates from the Commonwealth Youth Forum at the Queen Elizabeth II Conference Centre. The former “Suits” star is wearing a £1,450 belted Altuzarra pinstripe dress as well as a Camilla and Marc’s blazer worn in a stylish’shoulder-robed’ style. She completes her look with Orton’s crossbody style bag and Tamara Mellon’s black suede heels. It seems the event is most high profile engagement yet for the brunette beauty, who confidently chats with the delegates to the conference. 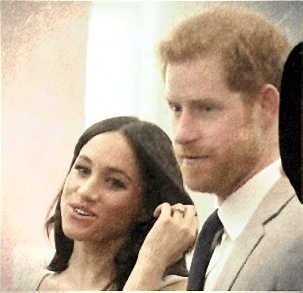 The 36-year-old actress seems to be determined to balance the wedding planning and many royal engagements as possible ahead of her marriage to Prince Harry. Meanwhile, Queen Elizabeth II gave a new role as Commonwealth Youth Ambassador to Prince Harry, who opened its Youth Forum on Monday. Although Meghan did not have previous links to the Commonwealth, she was involved in women’s advocate for United Nation’s Political Participation and Leadership as well as undertaken several humanitarian missions. What’s Inside Duchess Kate Hospital Bag? Is Duchess Kate Back To London To Give Birth This Week?